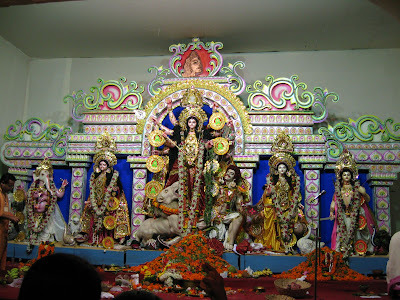 Ashtami – the eighth day of Navaratri is celebrated as Durgaashtami all over India. We too celebrated this day remembering the Devi in her avatar as MAHISHASURA MARDINI, for this was the decoration in the temple yesterday. 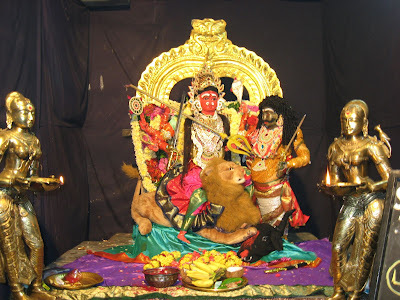 According to the Devi Mahatmyam, the Asura named Mahisha (who took the form of a wild bull) performed great penance to Brahma, who, pleased with him, offered a boon. Mahisha asked for immortality, which Brahma said was impossible. Mahisha then asked that he should not be killed by men, Devas, asuras, or any other creatures, and this boon was granted by Brahma. In his arrogance, he did not name women, for he considered them inferior to him. When the Devas could no longer bear the atrocities of Mahisha, they went with Brahma to Shiva and Vishnu, and asked them to relieve them of their troubles. Vishnu and Shiva’s anger presented itself in the form of a lustre, to which was added the lustre of the other gods – Brahma, Indra and all the other Devas. This divine lustre assumed the shape of a woman – the Devi, and was given the ornaments and the weapons of the gods. 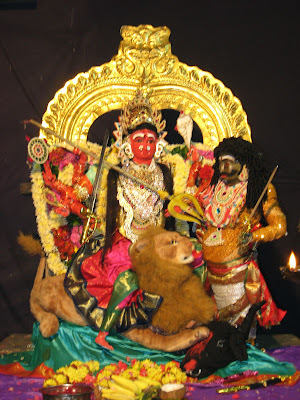 The Devi fought with Mahishasura for nine days and nine nights – the period which we now celebrate as Navaratri. On the tenth day, she killed the Asura, just as he was transforming into his Asura form from his Bull form. 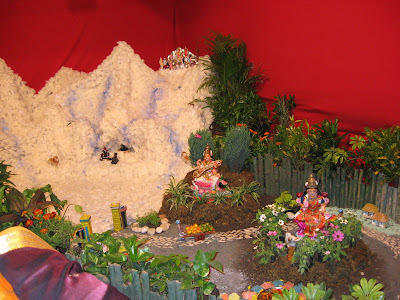 Thus, under the feet of the Devi, we can see the head of a bull, while the Asura is seen being killed. We also took the opportunity of visiting the Bengali Durga Puja Pandal at Chembur, where the same form of the Devi is worshipped. 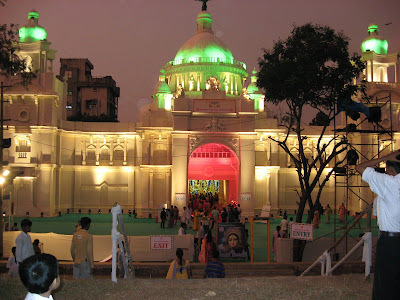 Samhith loved seeing the beautiful decoration at the Durga Puja, especially since it is his first visit. 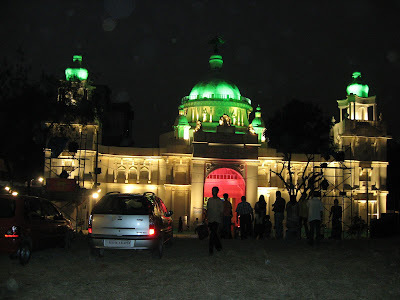 Here is the view of the wonderful setting for the Devi, where the organisers have tried to create a replica of the Victoria Memorial at Kolkata. 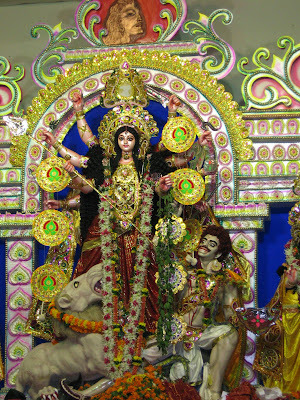 Here are the images of the deities…..
And here is the main deity – Mahishasura Mardini, again…. 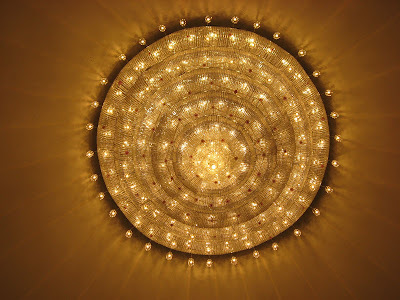 Here is the photo of a chandelier inside the hall, which Samhith was fascinated by…..
We also visited the Fine Arts Society, Chembur, to see their Bommai Kolu, which is one of the best in the area. 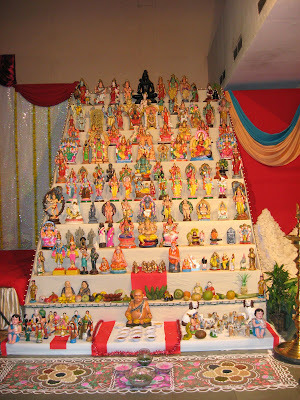 Here is the golu - with 11 steps…….. 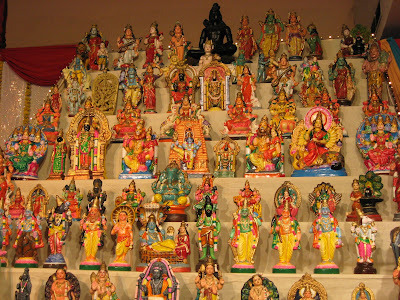 Most of their toys are old ones, handed over by old patrons, and hence of much better quality than is available these days. 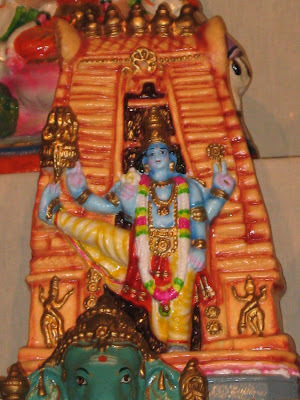 Take a closer look at some of them………..
Their Dasavatharam set is especially beautiful…..
And take a look at this figure of Vamana (the Vamana avatar) from the temple at Thirukolvilur near Thiruvannamalai. The beauty of the toys is amazing!! I didn't miss the temple alankaram after all! Pls tell Samhith that!He came down on navami and was very distressed that I missed all the "alangarams" and that it was Brahma and Saraswati that day :) I got to see on one of them on your blog.And I maintain that Raji's Kollu beats the Fine Arts Society one anyday for aesthetic and antique value; Raji's reminds me of the one at my grandmom's place where the dolls are more than a century old! 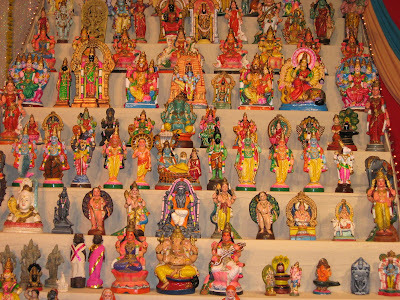 thanks usha, Shall tell my mom... she enjoys keeping the golu, and will be happy to hear your comment.